When D’Ceilo replaced Tea for Two in Jalan Bankung, I was very excited. 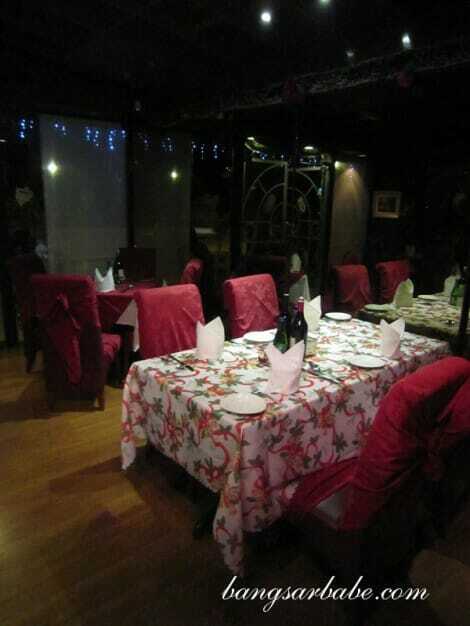 The place seems to have retained its cosy ambiance and the new owners spruced up the al fresco dining area. While waiting for my date, I sipped on a cup of flat white which had a chocolatey aftertaste. After a few queries, I learnt that some white chocolate was added into the coffee for a unique flavor. The chocolate flavor was quite subtle — I tasted hints of it towards the end of each sip. My date soon arrived and we sipped on their house wine, Lavila Syrah, a boutique wine from Spain. 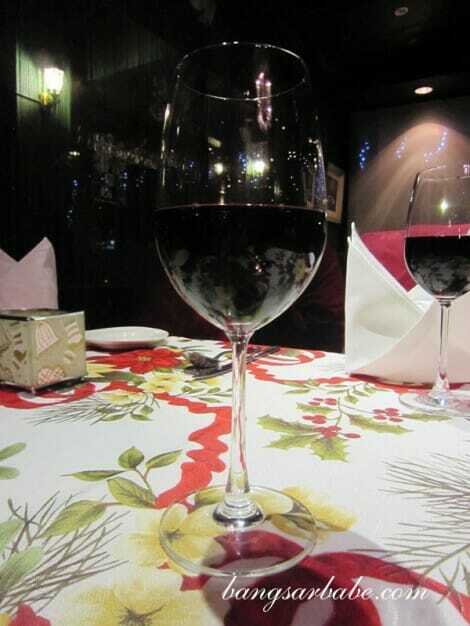 This wine had a lovely ruby colour and tasted fruity and sweet with a smooth finish. 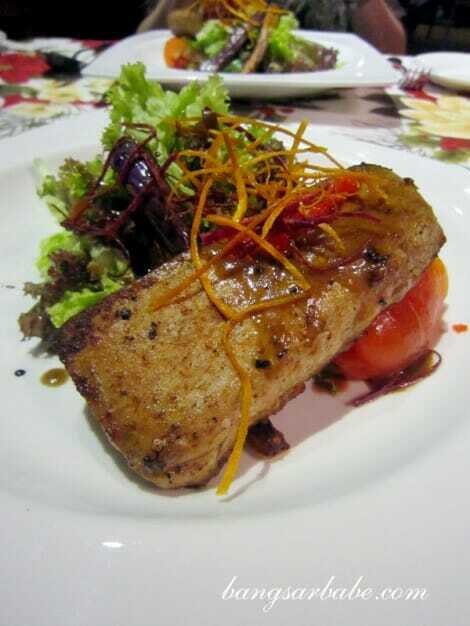 The menu comprises the standard Italian dishes as well as some chef’s special creations. 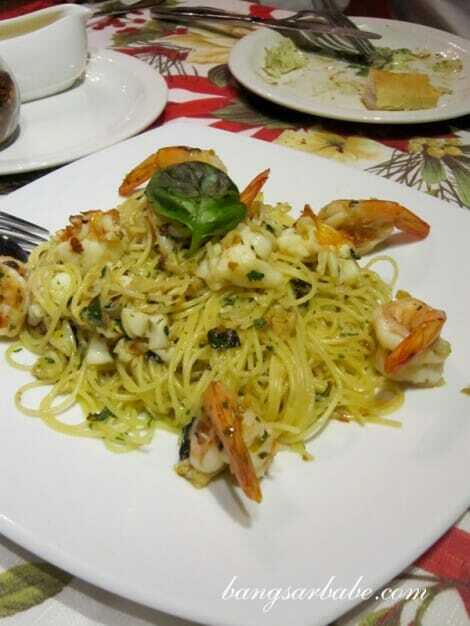 Prices are more than reasonable considering the fairly large portions, although the a la carte menu has a few expensive dishes such as the Spaghetti Grand D’Ceilo. 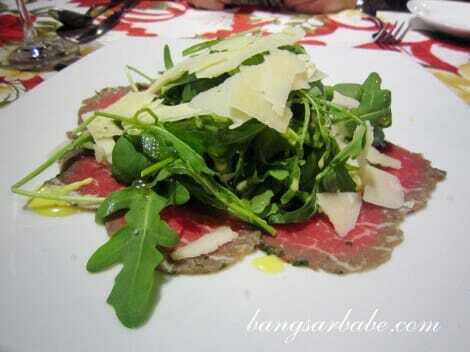 Our appetizer of beef carpaccio was ample for a portion for one. Wafers of sweet rare beef were capped with crisp rocket leaves, arugula, shaved Parmesan and moistened by drizzles of olive oil and vinaigrette dressing. 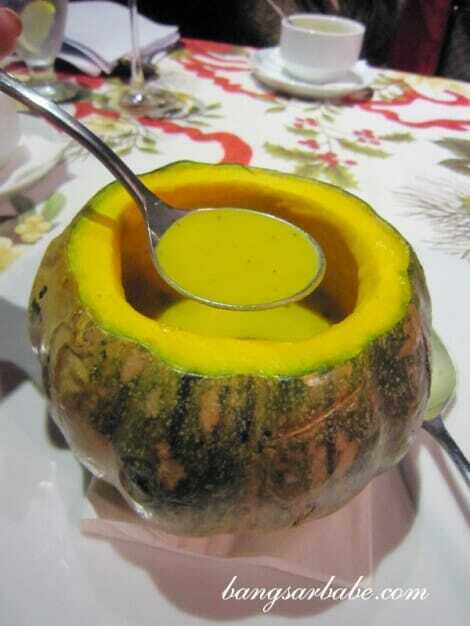 The pumpkin mint soup was sweet, smooth and unexpectedly filling. 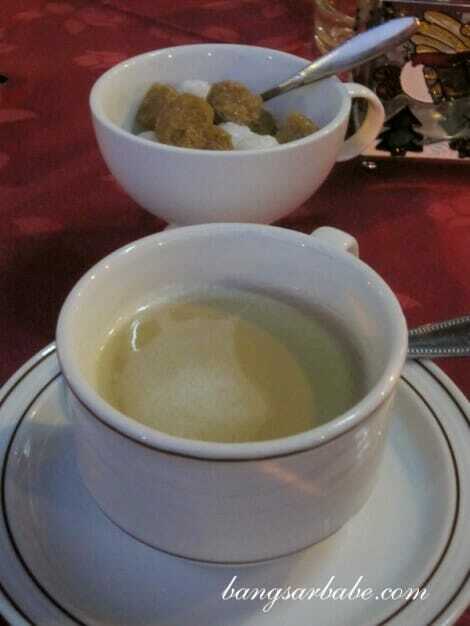 It had a mild, minty aftertaste which helped cut through the richness of the soup. 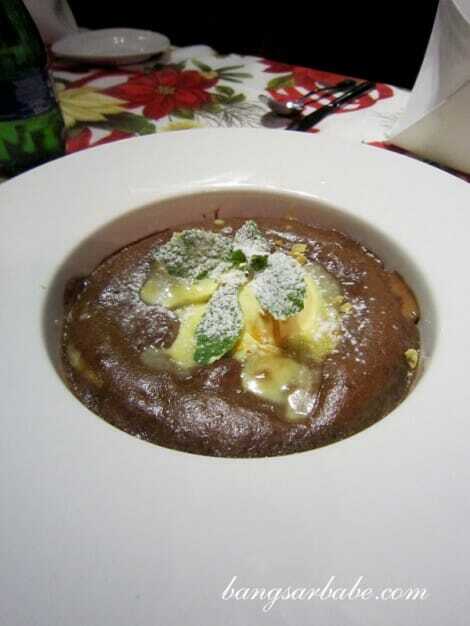 I like my pumpkin soups sweet and thick though, so I reckon the version without mint was more ideal for me. 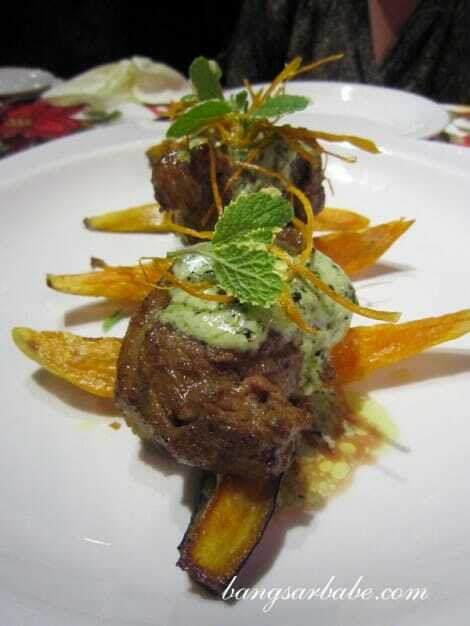 The charbroiled lamb medallion came with baked straw eggplant, sweet orange potato and topped with truffle thyme mint cream sauce. 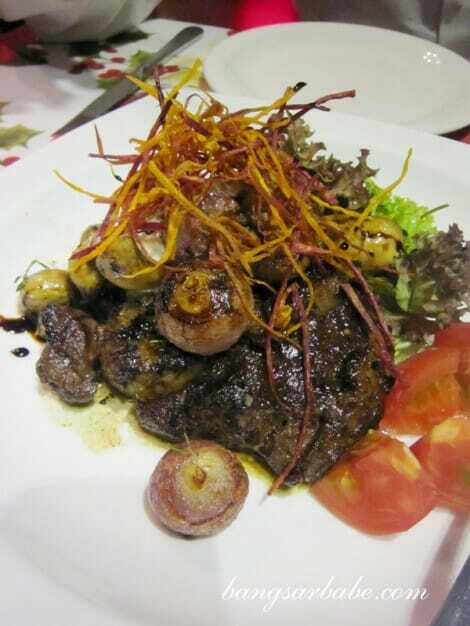 I didn’t really taste the truffle in the sauce, but it still paired nicely with the juicy and full-flavoured lamb. 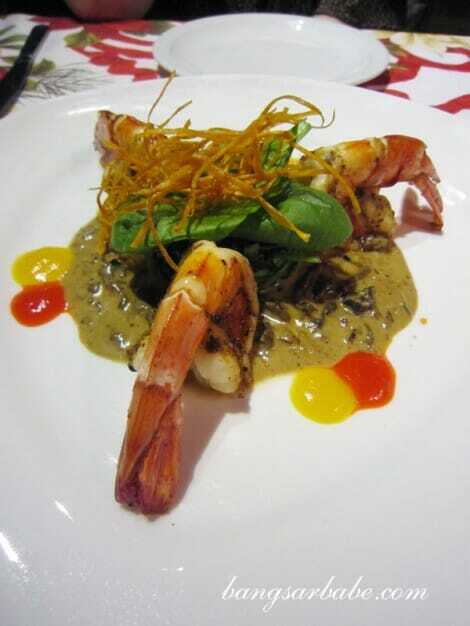 Another main course option for the Christmas Set Menu is the roasted king prawn with salted spinach, porcini, mushroom jus and capsicum coulis. The three large prawns were beautiful centerpieces, and they tasted as delicious as they looked. Each bite was succulent, sweet and flavourful. The accompanying spinach was lightly salted and had an almost creamy texture. 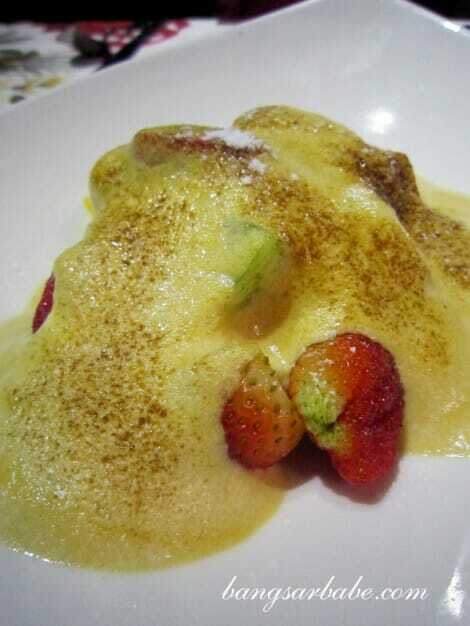 Dessert was the fruit sabayon, a frothy egg and cream mixture that was lightly browned on the top. The fruits were tart and just slightly warmed – lovely when eaten with the luscious sauce. 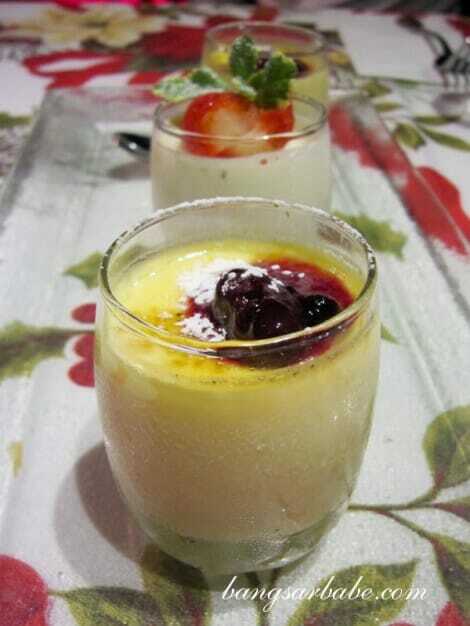 All the dishes above were a mix and match from D’Ceilo’s Green and Red Christmas Menu. *The Green Christmas Menu is priced at RM212 per person, and every 4 orders will come with a bottle of Lavila Red/White wine. 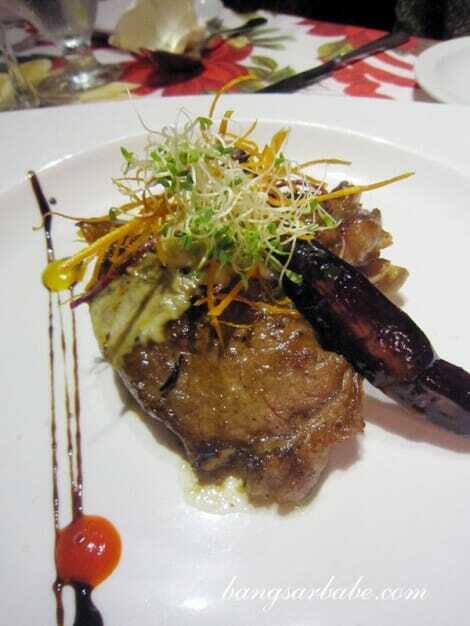 The Red Christmas Menu is priced at RM252 per person, and every 2 orders come with the Spanish Lavila Red/White wine. Besides the Christmas Set, we also sampled a few ala carte dishes – Pan Seared Duck Liver with Seared Pineapple, Wild Honey and Mango Salsa (RM58), Escargot with Garlic, Butter, Cheese and Cream (RM17.80 for 1/2 dozen), Alaskan King Crab Thermidor (RM83.80), Spaghetti Grand D’Ceilo (RM123) and the Blue Fin Tuna with Mesclun Bouquet, Baked Eggplant and Vinaigrette Dressing (RM53) and Wagyu Ribeye with Champignon and Gorgonzola Sauce (RM69++ per 100gm). 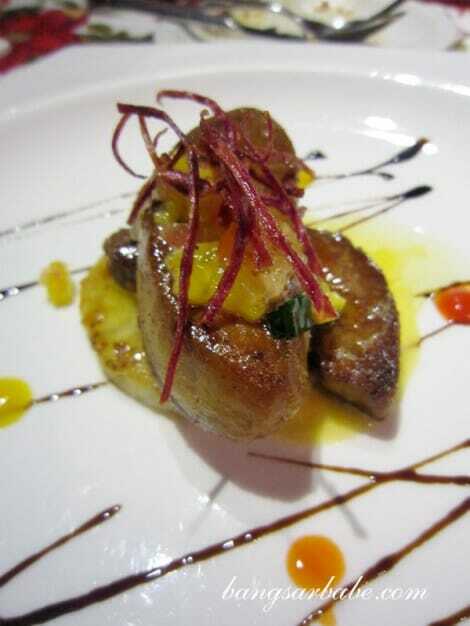 The foie gras was sumptuous. 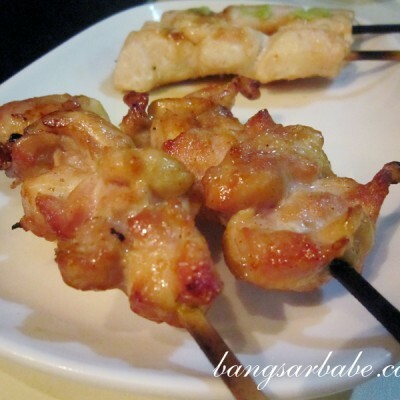 Tender, rich and delicately fatty, I could have eaten the whole serving; maybe even two. I liked how the sweet-tangy combination of pineapple and mango salsa accentuated the rich flavour of the liver without being over-cloying. 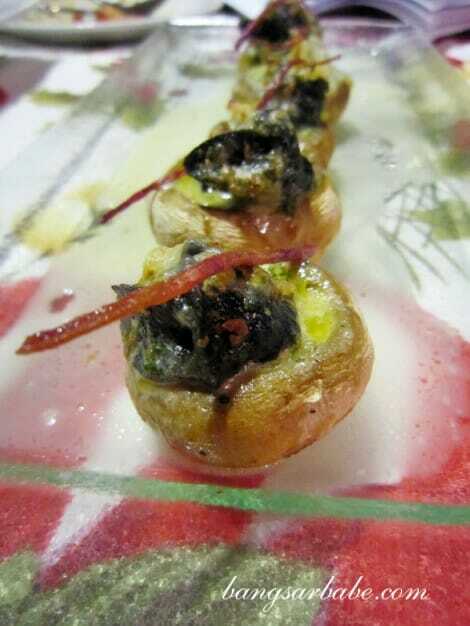 Unfortunately, the same could not be said about the escargot. It was overcooked. 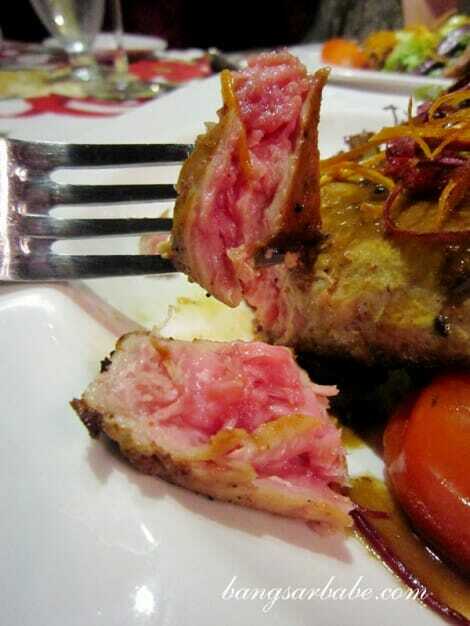 For RM53, pan seared blue fin tuna was of a generous portion. The tuna – with slightly crisp edges – boasted a rosy-red and moist centre. The vinaigrette dressing gave this dish a vibrant note and the greens were crisp and lovely. I would have preferred the gorgonzola sauce to be served separately and the ribeye to be medium rare rather than medium well, but those aside, it was a good dish. 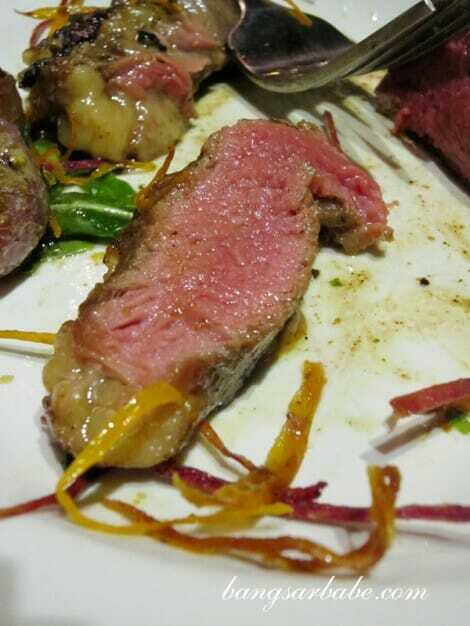 The waygu had a marbling score of 6 and was tender and adequately fatty. The most expensive pasta on the menu is the Spaghetti Grand D’Ceilo. 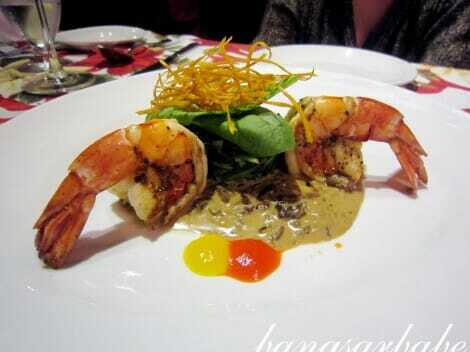 Priced at RM123 per portion, it comes with 750gms of red sea prawns and is large enough to feed 2-3 adults. 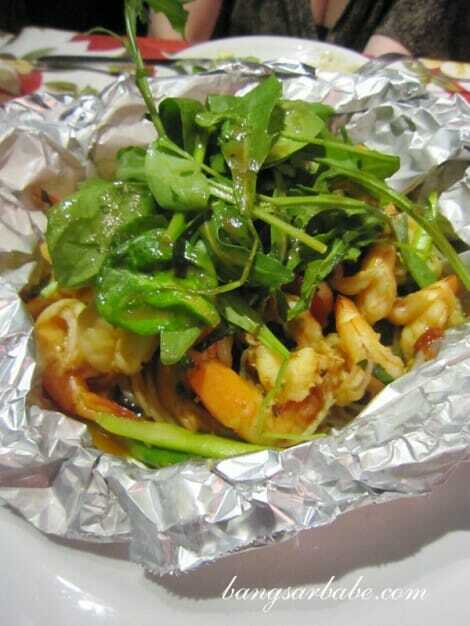 The prawns are lightly poached and tossed in the aglio olio pasta. 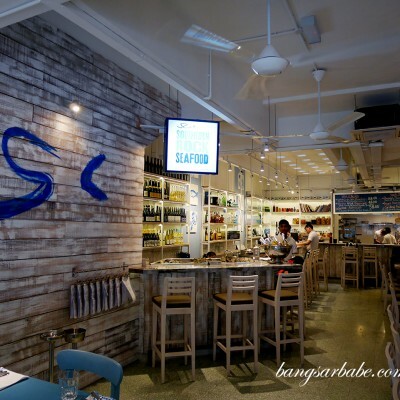 Seafood lovers would love this. Note that this dish is spicy, so those with butter tongues should ask that the chef tone down the spice level. 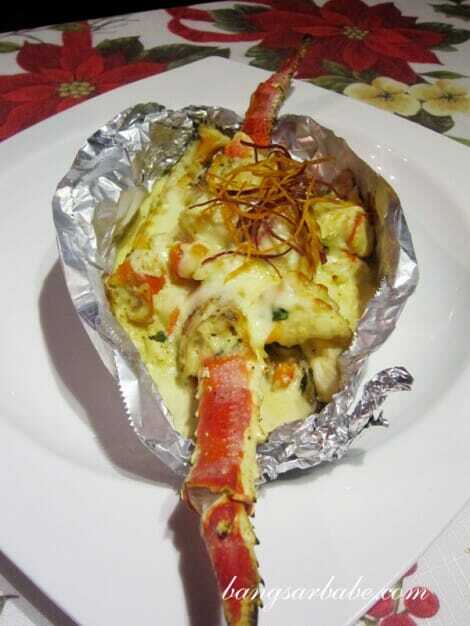 Also noteworthy was the Alaskan King Crab Thermidor, baked till golden brown on the outside. I omitted the pasta because I was already stuffed with all the other dishes. The Thermidor base was rich and creamy, while flesh of the crab was sweet and firm. I packed the balance of this dish home, but my scavenger sister gobbled it up for supper together with the grand d’ceilo. The chocolate volcano had a dense and gooey centre. I preferred this to the fruit sabayon, probably because I love all things chocolate. I returned with a good friend the very next day and ordered the same Caesar salad, rib eye with gorgonzola cream (RM59.50) and the pasta al aragosta (RM34.80). Verdict: Forget haute cuisine. The food at D’Ceilo is hearty and of good value for money.